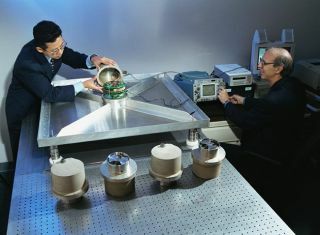 Dr. Richard Blakeslee (right) and Tony Kim (left) of the Marshall Center test the electric field mills used to measure lightning produced by thunderstorms. Lightningstrikes are known to increase as swirling tropical cyclones change inintensity,but whether the flashes are a signal of an impending monster hurricane,or asign of a fizzling storm, has eluded researchers for decades. Tomake the connection between lightning and intense hurricanes, NASAscientists willattempt a first-of-its-kind research mission. Three aircraft, includinganunmanned drone, will fly over tropicalcyclones (the generic name for tropicalstorms and hurricanes) in the Gulf ofMexico, Atlantic Ocean and Caribbean Sea during the agency's firstmajor U.S.-basedhurricanefield campaignsince 2001. Whileall three aircraft will gather crucial data, the remotelypiloted GlobalHawk airplane ? the same drone model flown by the U.S. Air Force? is themain event, so to speak. The Global Hawk can fly for up to 20 hours andwillcarry what's known as the Lightning Instrument Package (LIP), ahigh-techflight instrument that will track and document lightning as hurricanesdevelopand intensify. LIPhas flown nearly 100 missions already, but flying aboard the unmanneddrone willgive scientists an unprecedented, sustained look at the inner workingsofhurricanes and is a "game changer," said study team member RameshKakar of NASA. "Theavailability of the Global Hawk makes this a very exciting and uniqueexperiment," Kakar said. LIPand the other instruments used by the mission will work together tocreate the mostcomplete view of hurricane intensification to date. If theGlobal Hawk completesits mission, it would be the longest continuous observation of tropicalcyclonedevelopment ever recorded by an aircraft. "We'llbe able to see a storm in a way we've never seen it before," said LIPteamleader Richard Blakeslee at NASA's Marshall Space FlightCenter inHuntsville, Ala. "We'll see how the storm develops over the long term,andhow lightning varies with all the other things going on inside ahurricane.It's the difference between a single photograph and a full-lengthmovie. That'squite a paradigm shift." If scientists can figure out the ties between lightning and hurricaneseverity,meteorologists may be able to greatly improve their short-termforecasts forthese potentially destructive storms. Researchers have connectedlightning toeverything from strong winds to flooding to tornadoes, and a few extraminutesof warning time can save lives each year. "We can use lightning as a natural sensing tool to see into the heartof astorm," Blakeslee said. "Lightning allows us to get at rain and otherprocesses going on within a storm." Thisarticle was provided by OurAmazingPlanet,a sister site toSPACE.com.